Obituary for Mary (Jervey) Scarborough | Thompson Funeral Home, Inc.
Mary Jervey Scarborough, 68, of Orangeburg passed away on August 20, 2018. A memorial service will be held at 11:00 A.M. on Saturday, August 25, 2018 at the Church of the Redeemer, 1606 Russell Street in Orangeburg, S.C. Father John Burwell will be officiating. Mrs. Mary was born on October 5, 1949 in Orangeburg. She was the daughter of the late James Jervey and the late Lois Myers Jervey. She was a graduate of Orangeburg High School and Newberry College. Mary was the owner and operator of Acacia Flower Shop in Orangeburg. 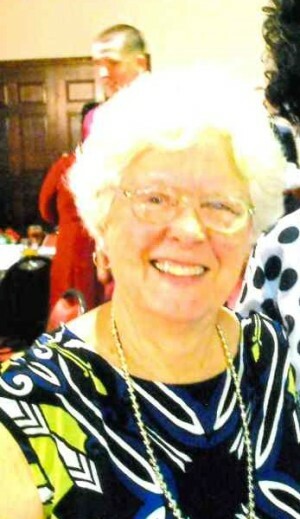 She was the past President of the South Carolina Floral Association, as well as, the Orangeburg Rotary Club. She was a District Governor for the Orangeburg Rotary Club. Mrs. Mary was a member of the Water Missions International, The Orangeburg Junior Service League and the Church of the Redeemer in Orangeburg. She was a volunteer at Marshall Elementary School. Survivors include her husband, Thomas Scarborough of Orangeburg; children, Jinny Cherry of Orangeburg, Catherine Conner (Cory) of Staunton, VA; step-children, Tommy Scarborough (Betsey) of Cincinnati, OH, Terri Head (Tony) of Greenville, Karen Scarborough (Jeff Fritz) of Cincinnati, OH; many grandchildren and great-grandchildren; brother, Frank Jervey of Columbia, S.C. and a sister, Jinny Jervey of Greenville, S.C.